Macaro-no cheese: my toddler devoured this! Lovely cream consistency, great for sneaking in veg (I wonder if it would work with carrots or parsnips?). I roasted the squash for half an hour instead of baking for - hour. To make this properly weeknight friendly I would either cook squash the night before or slow cook it during day. Added some nooch for savoury flavour. Santorini-style spaghetti with lemon, capers and tomatoes was gorgeous and quick to make. Definitely one to repeat. Made the hole mole black bean chilli. I liked it, husband didn't. I suspect that would be the same for any mole sauce and isn't a reflection of this recipe particularly. Would be good for a party. Doubt it would serve 6 as a main. Tortilla chips were easy and made a nice change from rice (although clearly not very healthy). Think you know vegan cooking? Lengthy, complicated recipe lists, expensive, hard-to-find ingredients, flavourless food? Think again! Let Aine Carlin, creator of popular vegan lifestyle blog Pea Soup Eats, enlighten you with her delicious recipes and straightforward tips. Keep it simple with easy-to-follow recipes, using a sensible number of ingredients that can be found in your local supermarket. Keep it tasty with chapters including Breakfast, Brunch & More, Light Lunches & Simple Suppers, Something Special, Sauces & Sides and Sweet Treats. Delight your senses and tantalise your tastebuds with Rosemary and Pear Stuffed French Toast, Santorini Spaghetti or Sweet Potato Sushi. Keep it fun - Aine is a truly creative cook who loves to whip up dishes that burst with colour and flavour, such as her Zesty Watermelon & Bulgar Wheat Salad. And don't be fooled into thinking there's no room for treats - Fudgy Brownies, anyone? But most of all, Keep it Vegan! 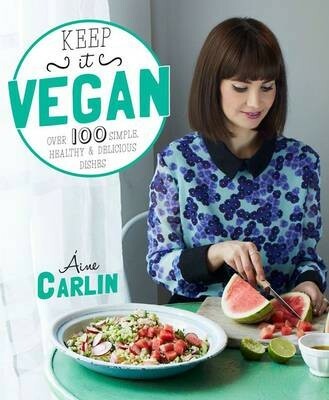 With this gorgeous selection of 100 simple, tasty and fun recipes, newcomers and long-time vegans alike will find plenty to keep them well-fed and inspired. The vegan diet is great for your health, bank balance and the environment, so what are you waiting for? Dive in and discover these vegan delights.